For the ultimate in plug & play digital microscopy conversions, the Moticam® 1SP/2/3+/5+/10+ are professional high-resolution digital cameras offering 1.3/2.0/3.0/5.0/10.0 megapixel resolution, featuring industrial metal cases. Focusing attention on a single position with integrated Region of Interest (ROI) selection. Saving of individual user settings for different microscopes. Allowing users to save their specific setup for any microscope, reducing time moving the camera between different microscopes and different brands. Superior capture interface allows for real time filtering with many different choices of effects. 30mm and 38mm eyepiece adapters; C-Ring; Dust Cap (on camera); Calibration Slide for accurate measurements; Macro Viewing Tube; USB Cable, Focus Target, Motic® Images Plus Software for PC and Mac. 2.0 USB port on all except 5+ which has a 3.0 USB port. A truly versatile, affordable, C-mount camera. This camera can stand alone; it does not require a computer for standard operation. Images can be captured directly onto an SD card at 2MP resolution. USB cable allows camera to be connected to a computer and used like any other Moticam® with the supplied software. The 1080 can also display live images at 1080p resolution through the HDMI output port and analog video through the AV output. 12mm CCD lens; 30mm and 38mm eyepiece adapters; C-Ring; Dust Cap (on camera); Calibration Slide for accurate measurements; Macro Viewing Tube; USB Cable, HDMI Cable, Focus Target, Motic® Images Plus Software 3.0 for PC and Mac. Moticam® X Unlock and unplug the power of your microscope with our new Moticam® X. The possibilities are endless. Welcome to the future of Wireless Digital Microscopy. The Moticam® X is a next generation microscope camera that will transform almost any old conventional microscope into a wireless device capable of sending live high resolution images to your WiFi Laptop or tablet devices. This revolutionary device sends streaming images to up to 6 WiFi enabled devices without the need for a router. The WiFi enabled devices include Tablets, Smart Phones, or Computers running on iOS, Android, OSX, or Windows. The Moticam® X generates its own WiFi signal so this camera can be used separate from your existing network. No additional routers are required. Viewing devices, WiFi enabled PC or Laptop with Motic® Images Plus; tablet or phone with freely downloadable MotiConnect App; universal viewer, almost any HTML 5 supported web browser. 12mm focusable lens; 30mm and 38mm eyepiece adapters; C-Ring; Dust Cap (on camera); Calibration Slide for accurate measurements; Macro Viewing Tube, Focus Target; Motic® Images Plus Software for PC and Mac. The Moticam® BTU10 is a 5.0 MP CMOS camera equipped with a 10.1 inch Android 4.4 tablet. The BTU10 is powered by a 1.66GHz (Quad Core) CPU with built-in DDR3 memory, and also equipped with WiFi (802.11 b/g/n), Bluetooth 3.1, mini HDMI output (1080p), built in MIC and speaker, and Micro SD card slot. C-mount adapter required. The Moticam® BTU8 is a 5.0 MP CMOS camera equipped with a 8 inch Android 5.0 tablet. The BTU8 is powered by a 1.83GHz (Quad Core) CPU with built-in DDR3 memory, and also equipped with WiFi (802.11 b/g/n), Bluetooth 3.1, mini HDMI output (1080P), built in MIC and speaker, and Micro SD card slot. C-mount adapter required. The following adapters and accessories are separately available for upgrades or for use with other cameras. The focusable camera lens with C-mount thread needs to be matched with the chip size of the camera to capture the correct field of view. The lenses can be combined with the eyepiece couplers or macrotube for digital photography. Four different sizes of microscope eyepiece couplers are provided in a set: 28, 30 , 34 and 35mm. 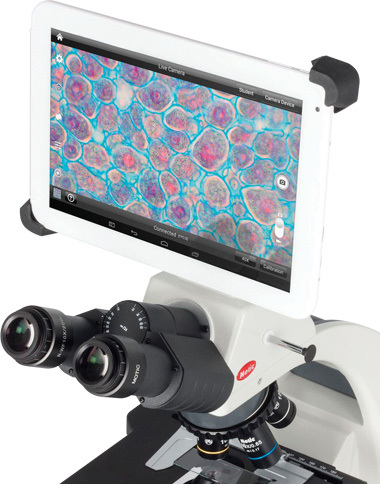 Use one of these together with a focusable lens (see above) to upgrade virtually any microscope to digital imaging. The focusable Motic® B&S adapter combines the focusable camera lens and the microscope eyepiece in one adapter thus increasing optical resolution. Either slide it into the eyetube of your microscope or fit it over oversized eyepieces. The Motic® B&S adapter fits directly into eyepiece tubes with a diameter of 23.5 or 30mm. The outside adapters will go up to 38mm or up to 44mm. The Motic® B&S adapter must be purchased separately. The Macrotube allows for digital macro imaging if used with one of the focusable digital camera lenses. All Moticam® digital cameras include the versatile Motic® Images Plus 2.0 Multi-Language application software. Additional software packages are available to make more use of your digital microscope equipped with a Moticam®. Capture real-time still, moving or time-lapse images with a simple click of your mouse. Store and retrieve still and streaming video in common formats. Make accurate measurements which can be exported to Excel. 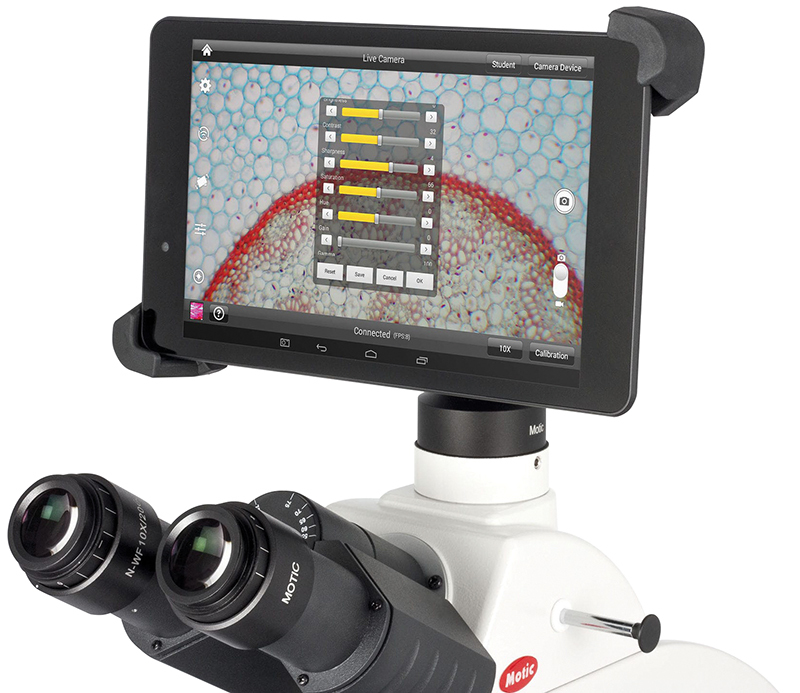 Connect to another Motic® Digital Microscope user with Distance Image Sharing (DIS) and share streaming video. Combine and compare images with amalgamation. Process the image with a variety of filters, or adjust brightness, contrast and color. Add sound or narration to your image. Create detailed reports, findings and examination papers using Motic® Report. This software allows the user to select between different languages. Available are: English, German, French, Spanish, Portuguese, Italian, Korean, Arabic and Chinese. Available for PC (XP or higher) and for Mac (with OS X or higher). Motic® HUB technology is integrated into Motic® Images Plus software, turning your existing wired Moticam® or Digital Microscope (originally shipped with Motic® software) into a streaming WiFi digital solution. This free feature allows you to attach your digital microscope or camera to your existing wired WiFi equipped computer and then stream the image through your existing network for others to pickup on their WiFi tablets, phones or computers. Approximately every 6 months a new update of the Motic® Images Plus 2.0 can be downloaded from the Motic® website. Once you have purchased a Motic® Digital Microscope or Moticam® you can get FREE unlimited updates. More features for digital image processing and particle measurement are offered with the Motic® Images Advanced 3.2 Software. Motic® Images Plus 3.0 Software (Windows, OSX and Linux) - All new redesign of the 2.0 Images Plus Software offers user-friendly interface, customizable options, live measurements. Multi-platform software. Supplied with the Motic®BTU8 and BTU10 Touchscreen Tablet Cameras. Motic® Images Advanced 3.2 Software (PC only) - Offers more additional features for digital image processing, feature measurement, multi focus and image assembly. List of features for Images Advanced 3.2. Motic® Image Multi Focus Professional Edition (PC only) - Combines several images taken at different focal depths to provide a focused image with a higher depth of focus. It also takes into account image shift due to focusing in stereo microscopes. Features of Image Multi Focus. Motic® Image Assembly Professional Edition (PC only) - Combine several images taken in one plane in one image. The software compensates for overlaps and image shifts. Allows creation of high resolution images with a large field of view.